The 2009 Mustang Bullitt brings back the style of the 1968 Mustang fastback used in the 1968 Steve McQueen movie Bullitt. Available in either Highland Green (unique to Bullitt) or Black exterior paint choices. Standard options on this special model include modified 18-inch micro machined Euro-flange Bullitt wheels with a satin finish; tri-bar pony wheel caps; dark gray painted calipers; satin finish Bullitt emblems/badging; 3.5 inch stainless steel packed exhaust tips; ram air and other improvements added to the 4.6 liter, 3-valve, single-overhead cam, V8 engine; and special handling. 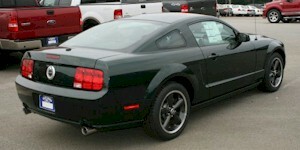 A Ford promotional photo of a Highland Green 2009 Mustang Bullitt with 18 inch premium gray painted cast aluminum wheels, a pony-less front grille, and 4.6L (281 cubic inch) V8 engine rated at 319hp. The Bullitt V8 has the Ford Racing Power Upgrade which increases the horsepower over the GT by 19.